At the recent Marimekko show, held during Mercedes-Benz Fashion Week in New York City, color was in full bloom. "The Marimekko Spring/Summer 2013 clothing collection is themed 'Art of Print Making - Color for a Reason'" says Noora Niinikoski, Head of Fashion Design for Marimekko. "Color and prints bring fun, and Marimekko is all about a positive energy." To complement the collection, a sculptural, subtle wave with a low pony was created by Jon Reyman for Aveda. 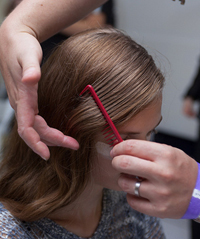 "The look for Marimekko is intentional, but not overdone," says Jon Reyman for Aveda. "Hair is backcombed on top of the head for volume and parted deeply on the left side to create a square shape. 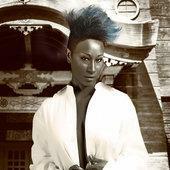 Fingers raked through the hair create texture that gives the style movement." 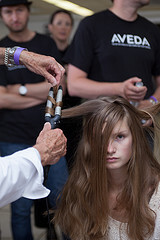 Prep hair with Aveda Pure Abundance Style Prep at the front and sides; tip head forward and blowdry with a round brush to pull out kinks or curls. Create a low section from behind the ears and the top of the crown; pull back and secure with an elastic band for a low pony at the nape. Create a strong, horizontal part on or just below the parietal ridge on the left side of the head. Spray with Control Force Firm Hold Hair Spray to maintain part. Create a section on top of the head from the left part to the right parietal ridge. Working from the top of the crown and moving forward, backcomb hair in sections, building up the sides slightly more than the center - this will help achieve the square shape on top of the head. Sweep hair over to the right and smooth out on top using a brush. Emulsify a dime-sized dollop of Aveda Light Elements Texturizing Cream in your hands and rake through top section. Spritz Pure Abundance Volumizing Hairspray for added hold and texture as you rake hands through hair. Smooth side sections back with hands, and secure the entire top section into a second ponytail with an elastic just above the anchor pony. Hide the elastic by wrapping a small section of hair from the anchor pony around both ponytails to combine into one; secure with bobby pin. 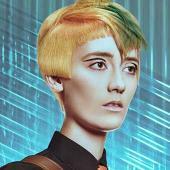 Use a rattail comb to perfect the top section into a square, placing pins as necessary to shape and hold hair in place. Hair in the ponytail should not be too neat-looking; muss with hands if a little texture is needed. Finish with Aveda Control Force Firm Hold Hair Spray and remove unnecessary pins.